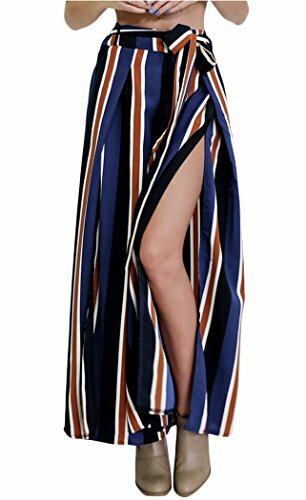 Oops Style Womens Striped High-waisted Culottes Wide Leg Pants,Petite size,please check the waist size before you buy. Elastic and stretchy waist with belt. Occasion: suitable for daily, club, travel, nigth out, business, office wear. season spring/summer/fall. Perfectly match with tees, halter tops, flats, heels. Design features: wide flare leg, stripes, slit, high waist. 100% Service Quality Guarantee! Oops Style promises you what you see is what you get. Good quality. If you have any questions about this product by Oops Style, contact us by completing and submitting the form below. If you are looking for a specif part number, please include it with your message.